How top traders made huge profits during the most momentous market events of the past century Financial and commodity markets are characterized by periodic crashes and upside explosions. In retrospect, the reasons behind these abrupt movements often seem very clear, but generally few people understand what's happening at the time. Top traders and investors like George Soros or Jesse Livermore have stood apart from the crowd and capitalized on their unique insights to capture huge profits. 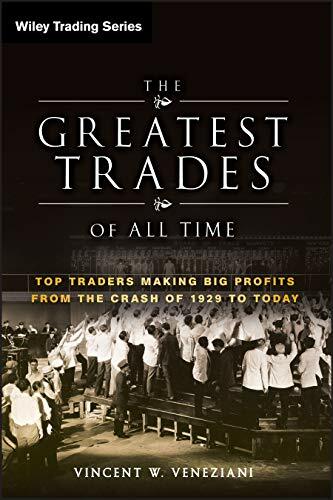 Engaging and informative, The Greatest Trades of All Time chronicles how a select few traders anticipated market eruptions?from the 1929 stock market crash to the 2008 subprime mortgage meltdown?and positioned themselves to excel while a majority of others failed. Along the way, author Vincent Veneziani describes the economic and financial forces that led to each market cataclysm and how these individuals perceived what was happening beforehand and why they decided to place big bets, often at great risk and in opposition to consensus opinion at the time. * Traders discussed include George Soros, Jesse Livermore, Paul Tudor Jones, John Templeton, and John Paulson * Provide contemporary traders and investors with insights on how great traders make great trades * Offers insights on market forecasting, mass psychology, and the importance of personal conviction in trading At a time when many investors are looking to the past for answers to the future, this book brings important historical moments in the financial markets to life. "From The Boy Plunger to Chanos chewing on girl scout cookies, Vince brings the history of this game's greatest to life." "This is an exhilarating tour through the most audacious and profitable financial feats of our time. Veneziani shows us not just the greatest trades but the men who dared to make them." Vincent Veneziani is a trader and writer on markets, financial news, hedge funds, and? ?economics for financial publisher Markets Media. He has also appeared on CNBC, Russia Today, and the BBC as a commentator. Previously, Veneziani worked at Business Insider covering Wall Street and the economy. He has also written in the past for Gawker Media, AOL, the New York Daily News, Popular Mechanics, and TechCrunch. Veneziani currently resides in New York City.